Following the opening of a public debate on the autonomy of Nigeria’s Central Bank, I will like to do a follow up on my earlier blog post that touched on the autonomy of the Central Bank of Nigeria (CBN). In that blog post I had argued essentially that in the name of granting autonomy to the CBN, we may have inadvertently placed too many powers in the hands of governor. 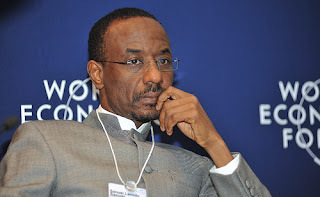 Sanusi Lamido Sanusi, Governor, Central Bank of Nigeria. Globally, there have been a lot of regulatory reforms in response to the global financial crisis. These reforms have been on how financial institutions operate and how financial regulators regulate. In Nigeria, there has been more of a reform of how financial institutions operate with little on how financial regulators regulate. The current move by the house to amend the CBN act, if that is all it is about, then will fall far short of what the Nigerian financial system needs. The challenge with the Nigerian financial system goes beyond a cosmetic amendment of the CBN act. There are critical questions about the Nigerian financial system that need to be addressed. These questions include asking if the current highly fragmented regulatory system is really working for the Nigerian financial system? Why is the Shadow banking system in coma despite the existence of several licensed operators in the sector? Why is the insurance sector in coma and why is it that the only time the insurance industry showed some promise was when banks went into the insurance business? Why are banks thriving why all other financial institutions are not? How do you harness the whole financial system, banks and non-banks for the benefit of the economy? The single act of just amending the CBN Act will not deal with the bigger issues faced by the Nigerian financial system. What we need is complete approach to reforming the Nigerian financial sector. This would involve reforms that include transparency in financial services, accountability, consumer protection and efficient competition in the financial system. In the raging debate over the proposed CBN amendment act, there has been the consistent argument that it would interfere with the independence of the CBN. However, if the purpose of the bill is to balance independence with accountability and transparency in the operations of the CBN, then the proposed amendment could actually enhance the capacity of the CBN to efficiently manage the Nigerian economy but not enough to make the Nigerian financial system work for the Nigerian economy. So far media reports have not revealed the full details of the reform other than argue that it is meant curtail the independence of the Central Bank of Nigeria. But a look at the UK financial regulatory system shows that even the Bank of England (BoE) does not have complete autonomy. The Governor of the Bank of England (BoE) which is equivalent of Nigeria’s Central Bank Governor reports to a supervisory body for the BoE called the Court of Directors (CoD) chaired by an independent chairman different from the governor of the BoE appointed by the Chancellor of the Exchequer, equivalent to Nigeria’s Finance Minister. The CoD is responsible for managing the day to day activities of the BoE except the formulation of monetary policy. The CoD delegates its functions to the Governor of the BoE which has to give account of its operations to the CoD. The CoD is made of 12 members appointed by the HM Treasury, and includes the governor of the BoE, two deputy governors and nine non-executive directors appointed for three year tenure each. The nine executive directors are appointed from different sectors of the economy including the banking industry. To ensure, the accountability of the board, they are subject to an effectiveness review by an independent external body on an annual basis. The CoD operate through different committees one of which is the Committee of the court (Nedco) made mainly of the Chairman of CoD and the non-executive directors of the committee and its main role is to review the performance of the BoE against its objectives and strategy. The bank also has the Financial Stability Committee (FSC) made up of the Governor of the BoE, two deputy governors and four non-executive directors of the CoD and a representative of the HM treasury. The committee is saddled with considering and approving all actions that are needed to preserve financial stability. Other committees of the CoD include the Financial Policy Committee (FPC), Remuneration Committee and the Audit and Risk Committee. The new Bank act 2009 and a proposed new Financial Services Bill put the BoE effectively in charge of ensuring financial stability of the UK Financial system. However, there are still specific areas like bank resolution options that involve the use of public funds that the 2009 UK banking act ensures that BoE can only act with the express collaboration of the HM Treasury equivalent to Nigeria’s ministry of finance. In terms of direct accountability to the parliament, the BoE annual reports are first presented to the UK parliament before they are presented to the public. Also BoE has to attend the UK House of Commons Committee on the Treasury, equivalent to Nigeria’s House Committee on Finance, regular hearings on its inflation and financial stability report. This helps the committee members to question the BoE rational for arriving at its monetary policy decisions. The House Commons committee also organises hearings for new member appointment into the MPC and the FPC though it has no power to reject the appointments. In essence, it is possible as along as the process is made transparent through mandatory disclosures of all processes. However, amending just the CBN act is not enough. There need to be a debate on the regulation of the whole financial system and whether the current fragmented regulation is appropriate for the Nigerian economy. The amendment of the CBN act can be the trigger for such a debate. By the way, the UK financial services bill will put the regulation of the insurance sector and other financial services under the BoE.